After years of being in development, Alton Towers Resort has announced its latest thrill experience set to open in spring 2018 – Wicker Man. Wicker Man is the United Kingdom’s first wooden rollercoaster in 21 years, and will bring together wood and fire into one experience for the first time ever. 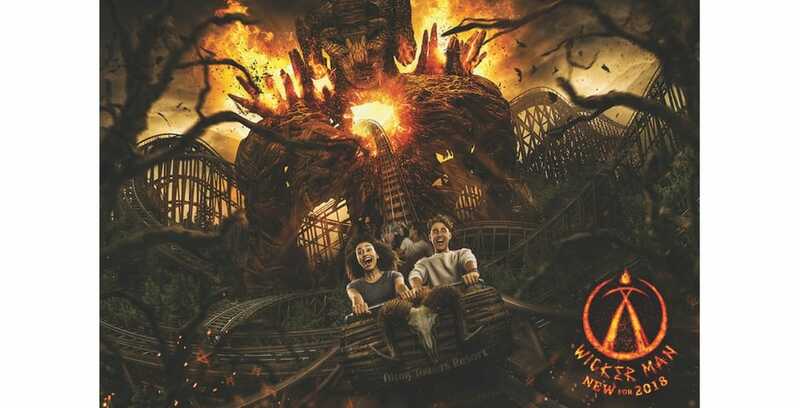 A Wicker Man structure will stand at six-stories tall in the center of Alton Towers, and will appear to burst into flames as the wooden coaster track races through it three separate times. The coaster is the latest in a series of ride openings from the park. Led by Great Coasters International, a team of experts and creators of wooden rollercoasters used the latest in proven safety technology, testing and training hours to be sure that this ride would be safe and ready for guests to enjoy. Guests visiting Alton Towers Resort in 2018 will get a chance to join in on this rite of passage as they are brought into the world of The Beornen, a mysterious group living in the woods that surround the park. “We hope visitors will be blown away by Wicker Man’s breath-taking scale whilst the primal essence of the wooden coaster and astonishing effects will leave them delighted, exhilarated and eager to ride again,” said Wynne. Wicker Man is set to open in spring 2018. For more information on the new coaster, visit altontowers.com/wickerman.